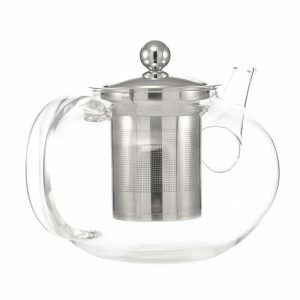 A large glass teapot that blends beautiful design with quality materials such as borosilicate glass & stainless steel. 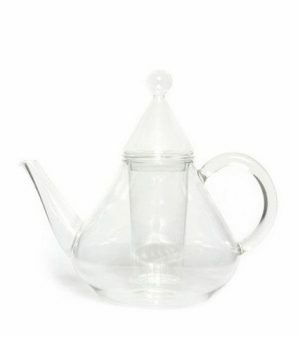 The JOLIETTE is a high-quality large glass teapot from GROSCHE. The glass body gives it a classic look while the stainless steel gives it a contemporary twist. The JOLIETTE effortlessly blends beautiful design with high-quality materials and perfect functionality. The JOLIETTE has a large capacity of 1250 ml / 42 fl. oz. and makes three to four large cups of tea at a time. 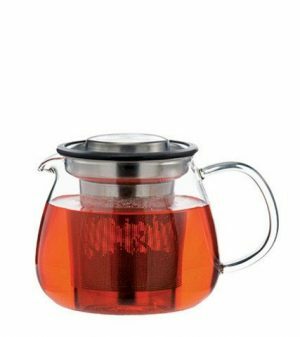 The JOLIETTE is a large teapot made of heatproof borosilicate glass. It can easily withstand boiling water and will never go cloudy even after years of use. Unlike fragile glass infuser, the stainless steeil infuser of the JOLIETTE teapot will never break. Its ultra-fine micro pores let your loose-leaf tea infuser effortlessly while keeping even the smallest tea particles in the strainer. The JOLIETTE is very easy and convenient to use. The large glass handle and non-drip spout make it easy to pour accurately. You can place the glass teapot in the dishwasher, but we recommend hand washing it after use with some soapy water to avoid accidental breakage. Never use harsh metallic scouring pads or metal spoons in a glass teapot. 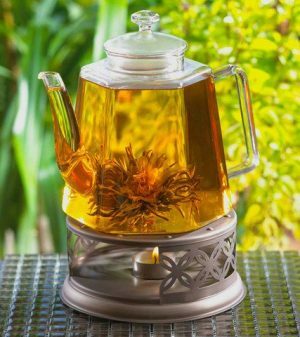 Place your favourite green tea, black tea, oolong tea or any other loose-leaf tea into the stainless steel infuser and pour hot water through the infuser into the teapot. The tea will slowly gain colour and expand comfortably in the infuser providing you a flavourful tea experience. Remove the infuser from your tea when the recommended steeping time is up or your tea has reached the desired intensity and replace the lid. With the purchase of any product, GROSCHE provides 50+ days of safe drinking water for people in need through the GROSCHE Safe Water Project. GROSCHE is a Social Enterprise and certified B Corp on a mission to make the world a better place.